Joe MacGown is an artist from Mississippi. His style of art is, as he described himself, of neogothic surrealism or subconscious meandering. 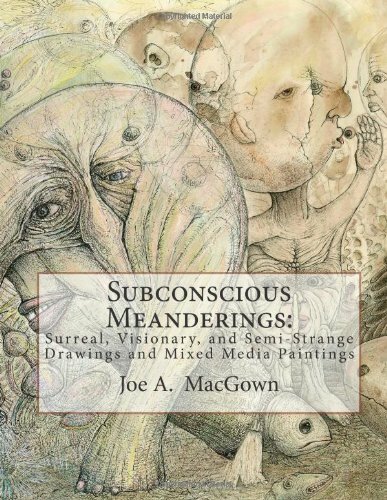 "Subconscious meandering" is his way of allowing ideas to flow from his mind to the canvas. This 96-page paperback is a self published artbook that features the pen, ink and mixed media illustrations he has created over more than 20 years. The illustrations are intricate, with every piece filled to the brim with little details and imagined alien-like organisms. MacGown has worked as scientific illustrator before with the opportunity to study nature up close under a microscope, and you can tell that many of the artworks are inspired by microscopic detail he sees through the lens. Many of the ink drawings are drawn on quite huge canvases, but they had to be scaled down for printing to fit inside this almost A4-size book. The subject matter is quite random but they are seem to be inspired by nature, such as a six-legged turtle with carvings of many other animals on its shell, several mandala-like designs that looks like they are constructed with bones or thorns, many surreal environments with detailed renderings. Half the book features ink drawings while the other half has the coloured mixed media works. You can check out more of his art on his website or support the artist by getting this book. And if you like this type of intricate ink drawings, check out The Art of Ian Miller too.